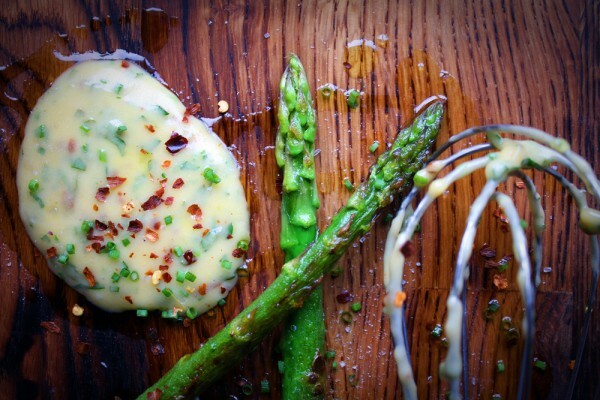 It’s time to learn how to make grilled asparagus with chili Bearnaise sauce. This is the type of dish you can never have too much of, do try it out. 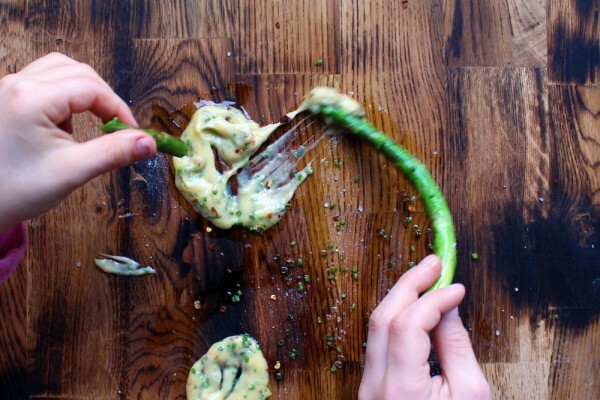 This appetizer of grilled asparagus with chili Bearnaise sauce is not as difficult as you might think. 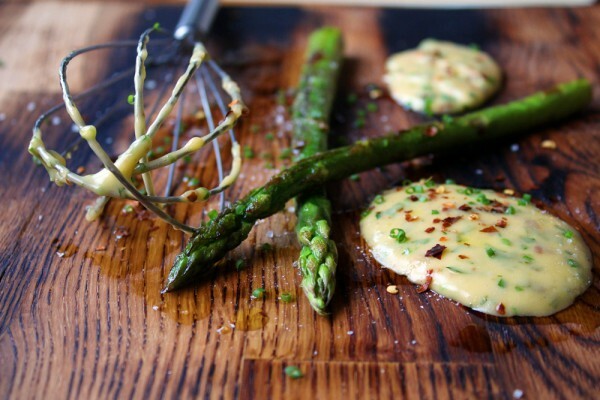 Asparagus is one amazing vegetable but serve it grilled or pan roasted with a chili flavored Bearnaise sauce and it gets amazing. Use fresh green asparagus, if they are thick you might need to peel the bottom part but often you can just trim off the bottom part. The easiest way to know if you need to peel them is simply to take a bite, if the skin stick or feels stringy, peel them. 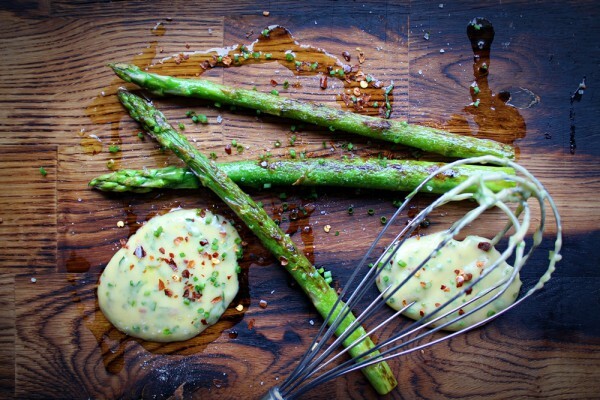 Whip up some classic Bearnaise and season it with dried chili flakes or fresh chilies if you have some. If you’re not in a tapas mood this is a great side to all grilled meats as well, just serve a lot, I guarantee success! Also if you´ve never made a warm emulsion sauce like Bearnaise before then make a practice batch before you invite people over since it can be a bit tricky the first time or two, good luck! For Bearnaise sauce you usually make a reduction using red wine vinegar, shallots, tarragon, pepper and let it all simmer for a while and then discarding the herbs and using the flavored vinegar with the egg yolks to start the sauce. This is a great way but it works fine to make it straight with the vinegar and add the spices and herbs as you go. Also, there is some debate on which herbs should be added, I’m staying out of this debate, just make sure you use tarragon which is essential for the flavor. This time I also added chives and parsley since those are my favorites. Heat the clarified butter and set aside. Whisk together egg yolks with the vinegar and a little bit of salt and pepper. Carefully heat it during whisking on low heat until it starts to thicken. In most recipes, this calls for a water bath but if you are careful it’s not a problem to do it on the stove. Once you have the egg and vinegar thick and warm remove it from the stove and start to add the warm butter a little at the time, if it gets too thick or starts to separate you can add a few drops of cold water to cool it down. Add all the butter and then season the sauce with all the chopped herbs and chili. Add more vinegar, salt and pepper if necessary. Roast the asparagus in olive oil in a pan and season with salt and pepper.